Supplemental material on the site DVD: Video of downbeating nystagmus increased by prone, powerful downbeating nystagmus, Central DBN (patient with MS). Downbeating nystagmus means that the eyes drift upward, and "beat" or jump downward. Examples are shown above. Explanations that have been offered for DBN include asymmetrical smooth pursuit and abberent tone in the central pathways serving the anterior semicircular canals (i.e. SVN region). 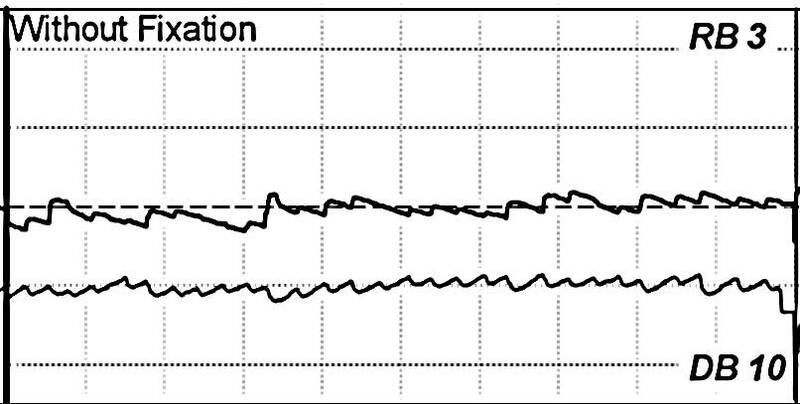 Experimentally, ablation of the cerebellar flocculus in monkeys produces downbeating nystagmus. Generally patients with flocullar disease, such as Chiari, have nystagmus that increases on lateral gaze. This is probably just one of many mechanisms. What diseases cause DBN ? DBN is classically attributed to the central nervous system (i.e. brain). The biggest single cause is the Chiari malformation. See the figure below for an illustration. Numerous large studies have been published, largely concluding that while the Chiari may contribute as many as 1/3 of cases, cerebellar degenerations, demyelinating disease, drug toxicity (e.g. amiodarone), neoplasia, and "idiopathic" are other common causes. In a review of 91 patients by Yee (1989), the most frequent causes were infarction, cerebellar and spinocerebellar degeneration syndromes, MS and developmental anomalies affecting the pons and cerebellum. Toxicity from anticonvulsant drugs probably causes nystagmus in a few patients and the author of this review has seen this more frequently than the other etiologies listed above. Clinical examinations, excluding eye movement recordings, were used to localize lesions. Localizations included the cerebellum in 88% of the patients. However, localizations to structures outside of the cerebellum were made in several patients. Wagner et al recently reviewed 117 patients with DBN (2008). Again, no cause was found in roughly 1/3 of patients, and of the remaining 62%, most were attributed to cerebellar disease. An association between bilateral vestibulopathy was reported in this series (38%), as well as polyneuropathy. The validity of the association with bilateral vestibulopathy is open to question however, as this association was made through a bedside test (head impulse test). In our practice, we have seen amiodarone neurotoxicity as a cause of downbeating nystagmus in several cases. Amiodarone is a medication used for atrial fibrillation, but it can be associated with ataxia and nystagmus (Palakurthy et al, 1987). The nystagmus is a cerebellar-pattern (increases on lateral gaze). Treatment for amiodarone neurotoxicity is to replace it with a different drug, such as sotolol. Multaq (dronedarone) is sometimes substituted for amiodarone. We are uncertain whether it has less toxicity than amiodarone. As an example, an 80 year old man was seen with atrial fibrillation, treated with amiodarone. He was unsteady, had prominent downbeating nystagmus, using a walker, and in assisted living. After his amiodarone was stopped, he returned to live in his own home, stopped using a walker, but needed to have a pacemaker put in. He continues to be somewhat unsteady, and continues to have downbeating nystagmus. We have also seen Lithium toxicity on several occasions, and there is a substantial literature concerning lithium as a cause for DBN. (Coppeto, Monteiro et al. 1983, Gracia, Koch et al. 1985, Yoshimoto 1987, Engelhardt and Neundorfer 1988, Williams, Troost et al. 1988, Corbett, Jacobson et al. 1989, Halmagyi, Lessell et al. 1989, Rosenberg 1989, Monteiro and Sampaio 1993). In the single autopsy study, damage was found in the MVN and NPH (Corbett, Jacobson et al. 1989). Lithium induced DBN occurs even when lithium levels are well controlled. Anticonvulsants are also a general cause of downbeating nystagmus, with lamotrigine having several relevant papers. (Alkawi, Kattah et al. 2005, Oh, Kim et al. 2006). We have encountered several patients with Lamotrigine toxicity manifesting as ataxia and downbeating nystagmus. One patient had toxicity due to being tapered off of phenobarbital (which induces the metabolism of lamotrigine). Another had a diurnal variation of her ataxia. Both responded within a few days to halving of their lamotrigine. A movie showing lamotrigine toxicity nystagmus is shown here. We have also encountered patients with DBN due to dilantin (phenytoin), a well known cerebellar toxin. Downbeating nystagmus is reported to often increase on supine positioning (Leigh and Zee, 1991), but the author has not confirmed this in his own practice. In fact, more often it seems to be increased prone (see movie). This was also the conclusion of Marti et al (2002). DBN that is greater supine might be sometimes attributable to anterior canal BPPV. DBN seems to vary with position without any clear reason -- sometimes increasing on backward, sometimes forward, and sometimes it is simply unaffected. Downbeating nystagmus, especially on lateral gaze, is the cardinal sign of a paraneoplastic cerebellar degeneration syndrome -- dizziness due to a cancer elsewhere in the body. In this case, the nystagmus characteristically increases on lateral gaze, and is accompanied by inability to walk. This is not the main cause of DBN, but as it is very important, one should be very alert to this possibility. If one confines ones attention to older persons with "matitutional" vertigo however, it does seem to be clearly related to supine positioning. In this case, it may be a peripheral nystagmus -- anterior canal BPPV, rather than a central nystagmus. This variant is only seen supine. Superior Canal Dehiscence. We have encountered several patients with DBN on prone. Small amounts of downbeating nystagmus are seen in many normal subjects when using sensitive recording methods (i.e. video ENG in the dark). If downbeating nystagmus cannot be seen during fixation, it is unlikely to reflect a serious pathology. May be associated with DBN (this is an observation of the author of this page). Similarly, upbeating nystagmus (another central nystagmus) can often be associated with migraine. Migraine is a common central disorder, and can produce many oculomotor signs. Downbeating nystagmus can be elicited by the head-shaking test. This is also called "perverted" head-shaking nystagmus -- a nystagmus which is not in the plane of head-stimulation. It is often associated with an underlying mechanism of migraine or cerebro-vascular disease (this is the authors unpublished opinion). "Perverted" head-shaking nystagmus has also been reported in persons with cerebellar lesions, and this may be the link between pathology and physiology. Downbeating nystagmus is sometimes elicited by Valsalva. This is usually innocuous but can also be a sign of Chiari or SCD. Ear disorders rarely cause DBN (at least sitting up). Congenital nystagmus is also rarely a cause of DBN. If a previously undiscovered DBN is encountered on an ENG recording, referral to a neurologist is usually a good idea, as most of the causes of DBN are central. 4 AP has been reported to be useful in DBN due to cerebellar disturbances. 4AP stands for 4-aminopyridine. Chlorzoxazone (an over the counter muscle relaxor) was suggested by Feil et al (2013) as being effective in a small, uncontrolled study of 10 patients. More study of this "small conductance calcium-activated potassium (SK) channel activator" is needed. Medications that are of general use for nystagmus may be helpful too -- benzodiazepines (such as klonazepam), gabapentin, and perhaps memantine. Alkawi, A., Kattah, J. C. and Wyman, K. (2005). "Downbeat nystagmus as a result of lamotrigine toxicity." Epilepsy Res 63(2-3): 85-88. Coppeto, J. R., Monteiro, M. L., Lessell, S., Bear, L. and Martinez-Maldonado, M. (1983). "Downbeat nystagmus. Long-term therapy with moderate-dose lithium carbonate." Arch Neurol 40(12): 754-755. Corbett, J. J., Jacobson, D. M., Thompson, H. S., Hart, M. N. and Albert, D. W. (1989). "Downbeating nystagmus and other ocular motor defects caused by lithium toxicity." Neurology 39(4): 481-487. Engelhardt, A. and Neundorfer, B. (1988). "[Downbeat nystagmus in lithium medication]." Nervenarzt 59(10): 624-627. Gracia, F., Koch, J. and Aziz, N. (1985). "Downbeat nystagmus as a side effect of lithium carbonate: case report." J Clin Psychiatry 46(7): 292-293. Guy, J. R. and Schatz, N. J. (1988). "Paraneoplastic downbeating nystagmus. A sign of occult malignancy." J Clin Neuroophthalmol 8(4): 269-272. Halmagyi, G. M., Lessell, I., Curthoys, I. S., Lessell, S. and Hoyt, W. F. (1989). "Lithium-induced downbeat nystagmus." Am J Ophthalmol 107(6): 664-670. Halmagyi, G. M., Rudge, P., Gresty, M. A. and Sanders, M. D. (1983). "Downbeating nystagmus. A review of 62 cases." Arch Neurol 40(13): 777-784. Leigh RJ, Zee DS. (1991) The neurology of eye movement (2nd Edn), FA Davis (Philadelpha). Longridge, N. S. and Mallinson, A. I. (1985). "Arnold-Chiari malformation and the otolaryngologist: place of magnetic resonance imaging and electronystagmography." Laryngoscope 95(3): 335-339. Monteiro, M. L. and Sampaio, C. M. (1993). "Lithium-induced downbeat nystagmus in a patient with Arnold-Chiari malformation." Am J Ophthalmol 116(5): 648-649. Oh, S. Y., Kim, J. S., Lee, Y. H., Lee, A. Y., Kim, J. and Kim, J. M. (2006). "Downbeat, positional, and perverted head-shaking nystagmus associated with lamotrigine toxicity." J Clin Neurol 2(4): 283-285. Rosenberg, M. L. (1989). "Permanent lithium-induced downbeating nystagmus." Arch Neurol 46(8): 839. Palakurthy, P. R., V. Iyer, et al. (1987). "Unusual neurotoxicity associated with amiodarone therapy." Arch Intern Med 147(5): 881-884. Williams, D. P., Troost, B. T. and Rogers, J. (1988). "Lithium-induced downbeat nystagmus." Arch Neurol 45(9): 1022-1023. Yee, R. D. (1989). "Downbeat nystagmus: characteristics and localization of lesions." Transactions of the American Ophthalmological Society 87: 984-1032. Yoshimoto, Y. (1987). "A case of lithium intoxication with downbeat vertical nystagmus." Auris Nasus Larynx 14(2): 71-75. Zasorin, N. L. and R. W. Baloh (1984). "Downbeat nystagmus with alcoholic cerebellar degeneration." Arch Neurol 41(12): 1301-1302.